Most of the Chinese Smartphone Brands Competing in India with each other, Race is just for providing most possible best feature under the budget. 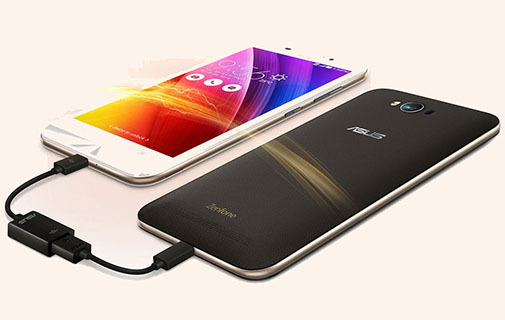 In this series the Asus Launches Zenfone Max with Enormous battery of 5000 mAh. The phone also has other good features like v5.0 (Lollipop)/Android v6.0.1 (Marshmallow) OS, Snapdragon 615/410, 13 MP rear and 5 MP Front camera, 16/32 GB ROM with 64 GB SD card support, 2/3 GB RAM and 5000 mAh battery. Asus retained its typical Zenfone alluring design, which is looking quite stunning in hand. Body is made up of plastic with metallic frame, it doesn’t have volume buttons on back like previous ZenFone, Power and Volume rockers are located on the right edge. Bottom houses USB cable slot and top has 3.5mm earphone jack. Some people may hate its bulkiness as phone is 10.6 mm thick with 202 grams of weight which may definitely influence some customer but this fact should also be reminded that it has 5000 mAh huge battery inside. Phone has large 5.5 IPS display with resolution of 720p. I personally think nowadays 1080p become common even for 5.0 inches display so at least Asus should make this phone with Full HD display. Display looks pretty vibrant till you don’t use your phone outdoor in sunlight where even in full brightness display looks slightly faded. Overall there is no major disappoint about the display, this fact support the phone that it has Corning Gorilla Glass 4 Protection. Phone is preloaded with 13 Megapixel primary camera supported by PDAF and laser autofocus. Camera is capable of taking the quite good details of a scene. We have seen the photos taken in daylight seem overexposed in bright light. The quick focus is quite impressive as it takes few seconds to focus. The 5MP front camera is just close to average. The Phone has two variants of the processor Snapdragon 410 and Snapdragon 615. So here is my advise; if you are series about the performance of the phone don’t buy Snapdragon 410 variants as it is neither good for Graphic intensive Games nor for the heavy applications, However both the version are running smoothly in default state without any heating issue. ZenFone Max with Snapdragon 615 version able to retain its smoothness in multitasking and Gaming. Ok now let’s discuss the best thing associated with this Smartphone; that is its Enormous 5000 mAh battery, where company claims this battery can stand for the 38 days. Apart from the claim this is true that phone can retain its charge for 2 days even after heavy use. Devices also support Reverse charging, means you can use it as power bank. An Enormous 5000 mAh battery. Display is protected with Corning Gorilla Glass 4. Headphone sound quality is poor. Sometimes freezes and screen goes black. To remove some bloat ware (which are installed in Root gallery) you need to Root your Phone so simply Download Kingroot this app will root your mobile and you can remove any app using Kingroot. ZenFone Max is great option for Budget conscious people who needs a powerful phone that can stand for 2-3 days without need of charging, phone is decent enough in all aspects like build quality, camera quality and performance (the performance of Snapdragon 615 variant is better than SD 410). If you don’t use mobile for gaming and heavy apps you can also choose Snapdragon 410. As we said the screen is not Full HD and there is no fingerprint sensor as its counterpart device LeTV 1s and Redmi Note 3. By the way, it is not Chinese brand. It is a Taiwanese brand.